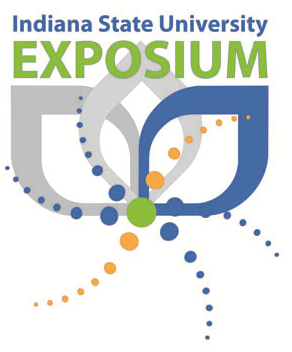 The Exposium is a program that celebrates the outstanding academic work of Indiana State University undergraduate and graduate students. Research and/or creative projects may be based on a class project, major paper, collaborative research with a faculty member, community engagement activities, or any efforts that highlights the research and creativity associated with the ISU student experience. Registered Students need to set up their project on the day of their presentation. Set up is between 8:00 - 9:45. Students are required to be present for one hour, but are encouraged to remain longer. Each presentation will be set up all day. Students that accepted support from the CSRC are Required to participate in Exposium. Fall Exposium will be the celebration of the research Undergraduate Students have worked on this Summer! Come Join us, September 12, 2018 10:00 - 2:00 in the Library Events Area. While there - Remember to vote on your favorite poster! The winner will receive a special award. Prepare a Professional Poster Presentation for the Exposium. The dimensions for a poster presentation are ordinarily 36 x 48 inches. In most cases, students will work with their faculty sponsor and/or department to prepare and print the final poster presentation. If a student is unable to print posters within their department, Multimedia Design and Research Programming Services (MDRPS) is able to print 36 x 48 “matte”-quality posters. The costs of these posters will be covered by CSRC. Posters printed at other dimensions or laminated must be paid for by the home academic department through an intramural voucher. All posters must be submitted to MDRPS by the faculty sponsor in final print format (usually as a single PPT slide with the dimensions 36 x 48) to MDRPS no later than two weeks before Exposium. Please note, students cannot submit their own posters — only the faculty sponsor can. Please contact MDRPST at 812-237-2675 for more information on printing.